A brotherly work of fiction! Infinite Blue was co-written by brothers Darren & Simon Groth. Not sure how the work was divided, or which part each brother wrote, but the end result is seamless; not feeling at all like there were multiple voices. Loved the magical realism bits in this book, and the subject of competitive swimming is something new to learn! I did feel the adult characters within the story were a little too cliché, but in a novel this length (which reads even shorter than the 180+ page count suggests) some stereotyping can be forgiven. Great book for high school libraries, and appropriate for most reading levels. Some say Haruki Murakami is a one-trick pony, and I cannot completely disagree. 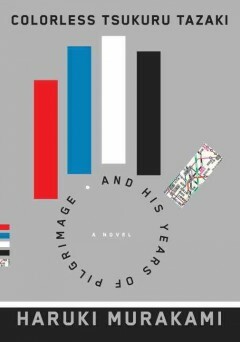 Though with his latest novel – Colorless Tsukuru Tazaki and His Years of Pilgrimage – I can confidently say that his “trick” is getting better and better. Colorless Tsukuru reads a lot like Norwegian Wood, which holds a special place in many readers’ hearts. Toru and Tsukuru are also very similar characters, but I found myself more interested in Tsukuru’s story. He’s a beautifully tortured character, alone and disconnected just enough from the world. But he also overcomes his solitude, and from a reader’s standpoint, it is an extremely positive and gratifying resolution. There is just enough magical realism (Murakami’s bread and butter) in the story to keep readers wondering; you never know when one idea will tie into another idea later in the story. Sometimes they do, sometimes they don’t and sometimes they require thinking about for an extended period of time. Most importantly, and just like in any of his books, Murakami’s writing is outstanding here. The man has a very special way with words, so much so that I will continue to read and be inspired by his work.